January Current Affairs. 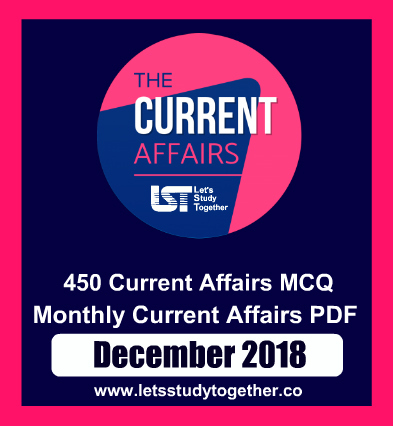 Important Current Affairs Questions – 29th January 2019. Daily Important Current Affairs. Daily Current Affairs PDF. Welcome to the www.letsstudytogether.co online Current Affairs section. If you are preparing for IBPS PO/Clerk, Canara Bank PO, banking & Insurance, SSC , Railways and other competitive exams, you will come across a section on the Current Affairs. Here we are providing you “Important G.K. & Current Affairs Questions “ in PDF format based on the current events for your daily practice. 1. In 2019, World Leprosy Day has been observed internationally on _______. Explanation: World Leprosy Day is observed internationally every year on the last Sunday of January to increase the public awareness of the Leprosyor Hansen’s Disease. This day was chosen in commemoration of the death of Gandhi, the leader of India who understood the importance of leprosy. Leprosy is one of the oldest recorded diseases in the world. It is an infectious chronic disease that targets the nervous system, especially the nerves in the cooler parts of the body – the hands, feet, and face. 2. _________& India have agreed to set up an ‘Energy Banking’ mechanism recently. 3. _________ was recently felicitated with the ‘Indian Chamber of Commerce (ICC) Social Impact’ award in the ‘Sustainable Environment category’. Explanation: Tetra Pak India, the world’s leading packaging and processing solutions provider was felicitated with the ‘Indian Chamber of Commerce (ICC) Social Impact’ award in the ‘Sustainable Environment category’. The award recognizes Tetra Pak’s leading efforts in setting up a sustainable ecosystem for recycling of used Tetra Pak cartons, using a multistakeholder approach and delivering measurable impact. The award recognizes excellence of organisations in the sphere of social investment, corporate social responsibility and sustainability. More than 80 project nominations were received across different project categories from corporates, NGOs and implementation agencies, of which 40 were shortlisted for further evaluation. 4.___________ has developed an app ‘Roshni’ to help the visually impaired recognise currency notes. Explanation: The Indian Institute of Technology (IIT), Ropar, has developed an app to help the visually impaired recognise currency notes. The app can recognise both old and new notes and gives audio information as to which note you are holding in your hands. The application is called Roshni and is free on the Google Play Store. The team comprising of Dr Puneet Goyal, PhD scholars Mandhatya Singh and Joohi Chauhan, and student R Ram from the institute demonstrated the app. The demonstration took place in the presence of students from Institute for Visually Impaired, Chandigarh. The claim is that Roshni is the first Android app to successfully recognise new INR currency notes. The new currency notes came into effect after demonitization. We now have Rs 2,000 notes while the old Rs 10, Rs 50, Rs 100, Rs 200 and Rs 500 got a refresh. 5. International Holocaust Remembrance Day is observed on ___________. Explanation: International Holocaust Remembrance Day, is an international memorial day on 27 Januarycommemorating the tragedy of the Holocaust that occurred during the Second World War. It commemorates the genocide that resulted in the death of an estimated 6 million Jewish people, 5 million Slavs, 3 million ethnic Poles, 200,000 Romani people, 250,000 mentally and physically disabled people, and 9,000 homosexual men by the Nazi regime and its collaborators. It was designated by the United Nations General Assembly resolution 60/7 on 1 November 2005 during the 42nd plenary session. The resolution came after a special session was held earlier that year on 24 January 2005 during which the United Nations General Assembly marked the 60th anniversary of the liberation of the Nazi concentration camps and the end of the Holocaust. 6. India has tested a new indigenous air-launched missile called NGARM. What does ‘R’ stand for in NGARM? Explanation: India has tested a new indigenous air-launched missile called NGARM, which is designed to destroy a variety of surveillance and radar targets on the ground after being fired from a Sukhoi-30MKI fighter.This new-generation anti-radiation missile (NGARM), with a strike range of around 100-km, is the first indigenous air-to-ground missile to be developed by the DRDO, after the supersonic BrahMos cruise missile developed jointly with Russia. 7. Bharat Fritz Werner Ltd (BFW), a Bengaluru-based machining solution provider, has partnered with ____________ to co-create robots for MSME sector. 8.GlaxoSmithKline merger deal with ______ has been approved recently by the fair trade regulator CCI. Explanation: GlaxoSmithKline Consumer Healthcare (GSKCH India) said its merger deal with Hindustan Unilever Limited (HUL) has been approved by the fair trade regulator CCI. The Competition Commission of India (CCI) has approved the scheme of amalgamation between the two companies, through an-all equity deal, valuing the total business of the latter at Rs 31,700 crore. 9. Dairy major Amul for the first time has launched camel milk in select markets of which among the following states? Explanation: Dairy major Amul for the first time has launched camel milk in select Gujarat markets — Gandhinagar, Ahmedabad and the Kutch. Sourced from the Kutch, the camel milk will be available in a 500 ml PET bottles priced at Rs 50, and needs to be refrigerated, as has a shelf life of three days, the dairy major said. Amul had earlier introduced a camel milk chocolate which continues to receive a good response, it said. 10. IRDAI recently set up a panel headed by ________ to identify domestically systemically important insurers (SII) and put in place an enhanced regulatory framework for them. Explanation: Insurance regulator IRDAI set up a panel to identity domestically systemically important insurers (SII) and put in place an enhanced regulatory framework for them. Explaining the rationale for having enhanced regulatory watch for SIIs, IRDAI said their failure has potential to cause significant disruption to the essential services they provide to policy holders and to the overall economic activity in the country. SIIs are perceived as insurers that are ‘too big to fail’. “The continued functioning of SIIs is critical for the uninterrupted availability of uninterrupted insurance services to the real economy,” said the Insurance Regulatory and Development Authority of India (Irdai). The committee headed by Pravin Kutumbe, Member-Finance & Investment, IRDAI, has been asked to submit report in six months. 11.________ and Etihad Guest, the loyalty programme of Etihad Airways, have joined hands to launch a travel specific Visa credit card for members and Indian travellers. Explanation: SBI Card and Etihad Guest, the loyalty programme of Etihad Airways, have joined hands to launch a travel specific Visa credit card for members and Indian travellers. This is the first international co-brand partnership of SBI Card, the country’s second largest credit card issuer. 12. Who had recently won the New South Wales men’s Amateur Golf Championship in Australia? Explanation: India’s Kartik Sharma won the New South Wales men’s Amateur Golf Championship in Australia. Kartik notched up a magnificent win over Australia’s Nathan Barberie in the scheduled 36-hole final to emerge as champion. The Gurgaon golfer has been playing for India since the age of 10 as part of the National Squad. 13. Elephanta Caves, sometimes seen in the news, is in which among the following states? Explanation: Elephanta Caves are a UNESCO World Heritage Site and a collection of cave temples predominantly dedicated to the Hindu god Shiva.They are located on Elephanta Island, or Gharapuri in Mumbai Harbour, 10 kilometres (6.2 mi) to the east of the city of Mumbai in the Indian state of Maharashtra. The island, located offshore about 2 kilometres (1.2 mi) west of the Jawaharlal Nehru Port, consists of five Shaivite caves and a few Buddhist stupa mounds that may be dating to the 2nd century BCE, as well as a small group of two Buddhist caves with water tanks. A unique event which will showcase the rich handloom and textile tradition of India is being held at Elephanta Caves.The first-of-its-kind event at Elephanta Caves is being organized by the Ministry of Textiles, in partnership with IMG Reliance. 14. India and _______ recently signed a protocol to export Indian tobacco leaves. Explanation: India and China recently signed a protocol to export Indian tobacco leaves to China, which is the largest consumer and producer of the tobacco with over 350 million smokers – the world’s highest. 15.Who was recently named the winner of the DSC Prize for South Asian Literature 2018 for his/her translated work No Presents Please? Explanation: Kannada author Jayant Kaikini, on 25 January, was named the winner of the DSC Prize for South Asian Literature 2018 for his translated work No Presents Please.The announcement was made at the Tata Steel Kolkata Literary Meet at the iconic Victoria Memorial Hall in Kolkata. The award was given to Kaikini and translator Tejaswini Niranjana, along with a trophy by eminent writer Ruskin Bond.